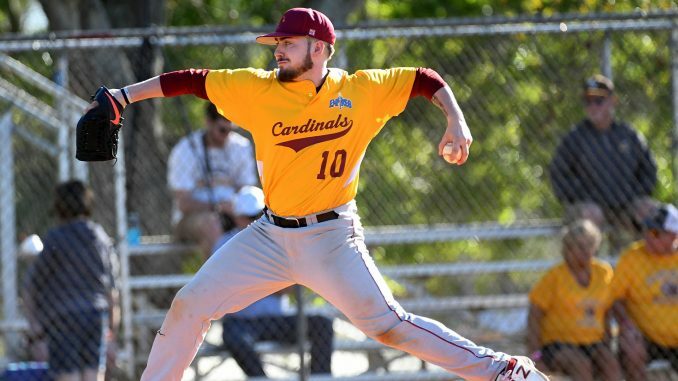 As baseball season is getting into full swing, left-handed reliever Dillan Wilkinson hopes to help the Cardinals continue their successful season. The 5’9,” 170 lb sophomore is coming off an impressive freshman year in which he started two games and held the second-best ERA on the team with a 1.82. Wilkinson also finished his freshman season with a 4-1 record and was named to the Eastern College Athletic Conference (ECAC), Second Team All-New York Region while earning First Team All-Empire 8 honors as well. Wilkinson attended Liverpool High School in Syracuse and played two years of varsity baseball. His senior year, he was named to First Team ALL CNY. Already this season for the Cardinals, Wilkinson has pitched in eight games and currently holds an ERA of 1.38. He has a total of 13 strikeouts, which is just seven less than his freshman year total. He expects to build on his early success and already has his mind on the postseason. Coming into the season nationally ranked, the Cardinals had a lot to prove, but Wilkinson said that they didn’t feel that pressure. The 16-7 Cardinals are certainly improving as they are on a six-game winning streak and have won 12 of their last 13 games. Wilkinson has continued to improve as well, and has only allowed four hits in his last nine innings pitched. Teammate and fellow pitcher Sean Harris described Wilkinson as a “great leader” and recognizes Wilkinson as being part of the team’s recent success. The sophomore also mentioned that he has two more years of baseball and school to look forward to.